On a hot summer day, there's nothing better than a cool dip in a refreshing pool. And a swim can also provide some great fitness benefits for dogs and their people, too! 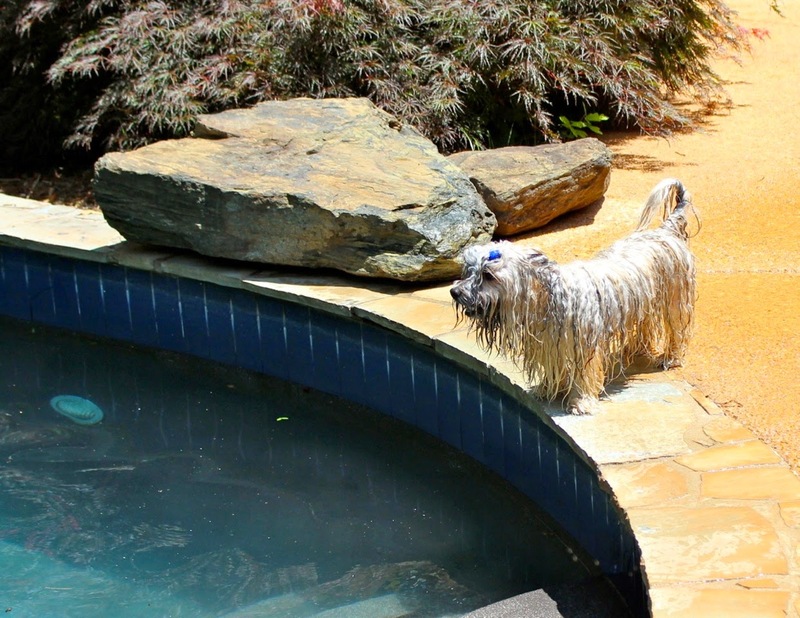 Rocco recently had the chance to go swimming at his pal Miko's pool. Of course, it's always safety first with pools and dogs and we kept an eye on the boys at all times. One of the first things both Miko and Rocco learned was the location of the steps to get in and out the pool. Rocco wasted no time in finding the steps and he launched himself into the water on his own! Rocco swam out and back and found the steps with no trouble at all. Good boy! Increased flexibility and strong, toned muscles also helps active dogs like Rocco avoid injuries. Another fun game to play in a pool is raft balancing! Rocco and Miko show off their balancing skills as they work their core muscles on the unsteady surface. Just like the games Rocco plays on his wobble board, balancing on the raft helps build body awareness, strength and confidence too! Then, after a swim, there's nothing better than a wet dog game of chase! Rocco loves the water and he's getting to be a stronger swimmer too. We don't get to swim too often, since we don't have a pool in our own backyard. But we both love it, every chance we get! Don't forget to enter our K9 Kamp giveaway with over $350 in terrific prizes! And remember, July 25th is the day to link up your K9 Kamp backyard fitness games. And, we're also honored to be nominated for a Pettie in the Best Overall Blog category. We're in some great company, including several of our pals. Check out the list here, and then to vote, click on the tab at the top, right of that page for "finalist voting," log in with your email or Facebook and then vote! We hope you'll consider voting for us once a day through August 7! Congrats on being a Pettie finalist. Miko has a really nice pool! I found out this week just how much Wilhelm now likes to swim- he jumped off a dock behind me! Fortunately he was on a leash but, yikes! I wish he and Rocco could swim together- they'd have a blast! Bailie just learned to really swim two weeks ago and absolutely loved it. Swimming is great fun and keeps us nice and cool. 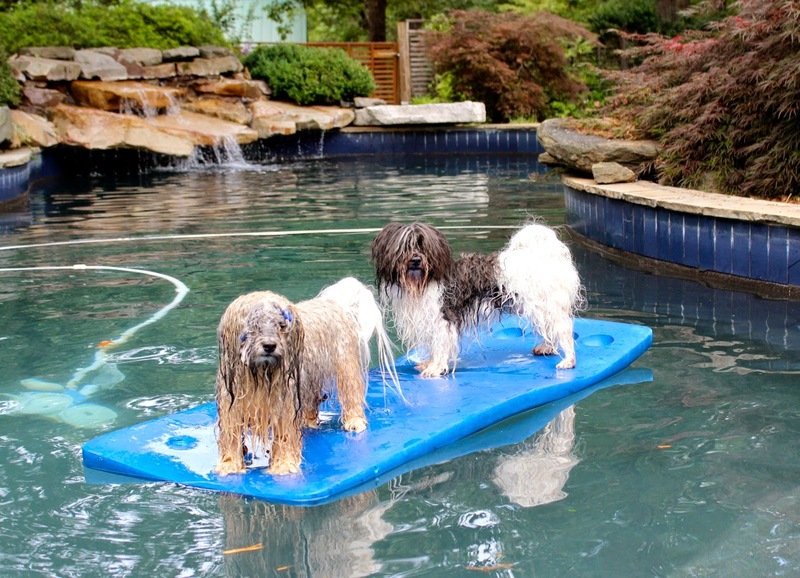 Love the photo of them dripping wet on the floating mat! Those are the cutest pictures! Barley is totally uninterested in the water, but she's never had a chance to be around something calmer like a pool--she's used to rushing rivers and crashing waves at the lake, so I can't blame her for not wanting to get in. That raft balance looks tough! Those two soaking wet dogs...so funny. But swimming is great exercise! We were lucky enough to get in a lot of swimming on our vacation! That looks like a lot of fun! Swimming is such great exercise and I wish we had the chance to do it more often. Simba has swam before, but it doesn't seem like he likes it all that great. I'll have to let him do it again and see if he likes it or not. I'm thinking about getting him a kiddie pool to play in first. When I put him in a pool it seemed as if he just thought of it as a big bathtub LOL. Congrats on your nomination! Pool Pawty! 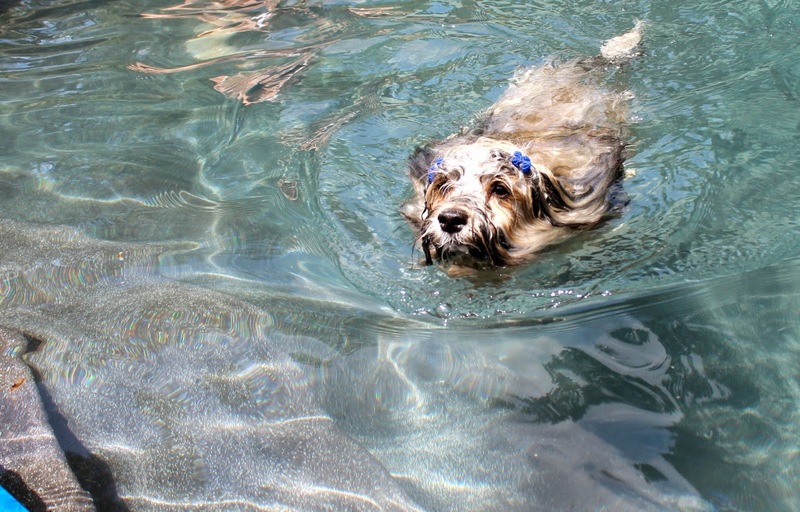 ;) Rocco looks so cute swimming ! We didn't think anyone liked swimming as much as we did. But after looking at these pics, we were clearly wrong! Great post and pics !! Mr. N can swim but he's not a fan. He will wade though. Oh that looks like such fun! Pools not really common here in England, sadly! I am super impressed with the raft balancing! Way to go Rocco and Miko, you are some super fit dogs. Two of my three LOVE to swim. I love that it is low impact for my girl with questionable hips. Swimming saved our sanity the first summer we had Küster. He had bad pano flare ups and the vet put him on crate rest to keep his bones from being jarred. A high drive puppy on crate rest is a nightmare. So, we started driving him out to the lake and letting him swim until he was good and tired every night. It was SO worth it, and the boy still loves to swim! Schooner and Skipper love swimming in our pool. They love going to Lake Michigan to swim and walk on the beach! Great exercise for them and me! We love the new look of your blog! Mr. K loves to swim but sadly, he can't. We just bought him his own Scottie-safe pool. Here he is checking it out for the first time: http://www.scottiemom.com/2014/06/gone-swimmin.html. Safe swimming, friends! Much love, The Scottie Mom. Jasmine loved water and loved swimming. Cookie seems to swim readily; didn't have that much opportunity yet. JD avoids swimming and unless he's really hot water in general. They had so much fun :) It's sorta funny that water exercise is commonly used for people with arthritis or other medical conditions yet I had never considered the benefits for my dog. I so need to find a place to take Maya swimming. We don't have a pool so its gotta be a lake. Pierson doesn't like other dogs so I have yet to take him swimming. Looks like Rocco had a blast! It swimming, since that was the way I expected to convey this swimming.